As I have mentioned in past blog posts, one of the interesting side effects of review sites is that independent hotels and smaller brands have a great shot at attracting new guests if they get great reviews. With TripAdvisor’s Popularity Index, hotels can get great page placement without spending money on advertising or worrying that they have an unknown brand. Gone are the days when serious travelers only stay at Hiltons or Hyatts because they have trusted brands. Today, it’s easy to get unbiased reviews of any hotel by visiting an OTA or a review site like TripAdvisor. On Sunday, I read an article in the New York Times about Stash Hotel Rewards. 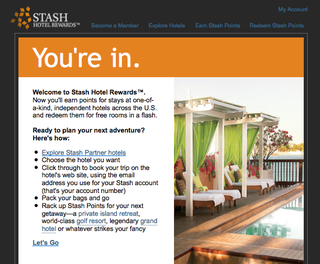 Stash Hotel Rewards is a loyalty rewards program for independent hotels. Guests who join the program receive 5 points for every dollar they spend with the member hotels and can redeem their points for free stays at member hotels. Today, member hotels come from hotel management companies such as Greystone Hotels, Denihan, Lenox, among others. Why is a loyalty program for independent hotels so important? If you look at the Market Metrix study from January 2010 called, “Why do guests select a hotel”, loyalty program points was ranked 4th at 18% after Guest Experience Factors, Location and Price. If this loyalty program takes off, there is little separating a chain from an indy in terms of benefits.